Will JPMorgan Chase Raise Its Dividend in 2017? The bank stock has soared lately, but will it be kind to dividend investors? Wall Street banking giant JPMorgan Chase (NYSE:JPM) has rebounded convincingly from its turmoil during the financial crisis, emerging as one of the strongest financial institutions in the business. The stock has climbed at an annual pace of more than 20% per year since 2009, culminating in a 55% leap over the past 12 months. Along the way, JPMorgan has restored and grown its dividend to the point that it now exceeds its pre-crisis levels, and investors hope that the Wall Street bank will reward shareholders yet again this year. Let's look more closely at whether JPMorgan Chase will raise its dividend in 2017. JPMorgan CEO Jamie Dimon. Image source: JPMorgan Chase. JPMorgan Chase has consistently given dividend investors substantial yields, even if quarterly payment growth hasn't always been a priority during its history. For instance, after making a dividend increase in 2001, JPMorgan kept its payout unchanged until 2007, despite enjoying considerable success along the way, thanks to strong conditions in the housing market and generally solid economic growth. However, most investors didn't have much to complain about because JPMorgan's dividend yield remained in a range of 2.5% to 4% throughout that time span, and the stock price steadily advanced during much of the period. Only in 2009 did JPMorgan succumb to the pressure of the financial crisis, slashing its dividend by 87% to just $0.05 per share. Yet unlike many of its banking peers, JPMorgan regained its financial footing quickly. By 2011, the bank got approval from the Federal Reserve to raise its dividend after passing stress tests, and it quickly quintupled its payout to $0.25 per share. In subsequent years, JPMorgan kept up the pace of its dividend growth -- with increases of 20% in 2012 and 27% in 2013 -- before seeing its growth rate slow down to the 5% to 10% range. JPMorgan's dividend increases have come as the banking giant has become more powerful and financially healthy than ever. The combination of retail and investment banking has been lucrative during the bull market in stocks and recovery in the housing market, and rising profits have helped to support the dividend. Of course, dividends haven't been the only way that JPMorgan Chase has returned capital to shareholders in its history. Stock buybacks have also played a big role. For example, in 2011, JPMorgan also committed to repurchasing up to $15 billion in stock to go along with its dividend increase. Since then, the company has authorized similar buybacks and used them to repurchase shares on a regular basis. 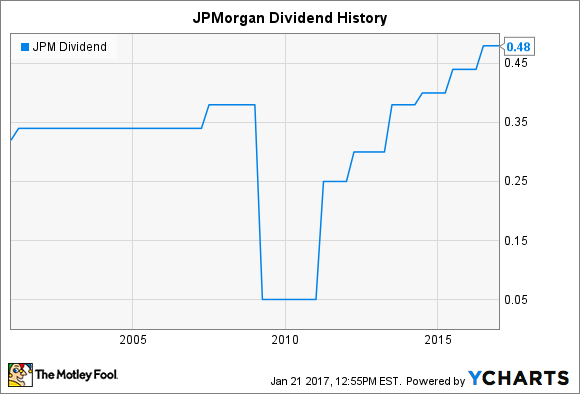 Will JPMorgan raise its dividend in 2017? CEO Jamie Dimon has said that he prefers dividends to buybacks and hopes that JPMorgan can push its payout ratio toward 50% of earnings in the future. As Dimon put it at a recent conference, "I think buying back stock is giving cash to my leaving shareholders. I care much more about the remaining shareholders. ... It might be better to give you a special dividend." Investors do have to remember, though, that JPMorgan's freedom to structure its capital strategy is still limited. Many are hopeful that a new administration in Washington will find ways to make regulation less onerous, and that could potentially include the battery of stress tests that JPMorgan and its peers have to go through every year in order to have their capital plans approved. Until that happens, though, JPMorgan might have to wait longer than it otherwise would in order to fully restore its dividend to the level it would like. Given the bank's recent success, investors should anticipate another dividend increase from JPMorgan Chase this year, likely coming near mid-year and probably adding another $0.04 to $0.05 per share to the quarterly payout. Moreover, if rising interest rates bring greater profits, then investors could enjoy accelerated share growth, both in 2017 and in years to come.